Dr. Warren's Blog | My practice and my world….. If you’re a fan of “The Blues” you already know what I mean. BB King died today at the ripe old age of 89. Not bad for an old Diabetic Guitar Player! As a very part time bass player, many of his tunes rank right up there for their simple yet grooving bass lines to compliment his great picking and singing/talking style. He will be missed. Yep, the spring allergy season is just kicking off. I’m not only seeing more patients with allergy symptoms and problems, I’m seeing higher pollen counts, specifically the tree pollens right now. There was a time when about all I had to offer patients during this time was oral medications just about guaranteed to knock them out and make them feel sluggish all day long. Now, there are several topical (eye drops) and oral medications that I can Rx to help my patients out. I also used to have to tell patients to cut down on the amount of time that they wore their contact lenses, to clean them extra well and to realize that they were going to have reduced lens comfort. Now, more frequent lens replacement helps patients deal with their contact lenses during allergy season better than ever. If you want to see what the pollen count is like locally, follow this link. If you are having watering, itchy, red or uncomfortable eyes, give the office a call and come on in. More than likely, I can help you enjoy our springtime weather better! Breaking Bad News To Patients – A Good Article…..
I’ve never formally thought about how I break bad news to patients of mine. Its usually letting someone who thought that they simply needed a better optical correction know that their problem can’t be fixed by “stronger glasses”, the problem is caused by a condition like Macular Degeneration, Cataracts, Glaucoma, Diabetic Retinopathy or Keratoconus. This article talks about a more “formal” approach that the author uses to teach medical students one of the arts of medical practice, handling patients, specifically when giving them bad news. Some good stuff here, for doctors and for patients. She has practiced in Racine previously and also has her own office in Oak Creek. She will be providing general ophthalmology services such as Cataract surgery, laser surgery for Glaucoma and minor eyelid procedures as well as others. You can learn more about her at her practice website by following this link. Dr. Unger is looking forward to rejoining the Racine health care community and has already provided outstanding surgical care to my patients in need of her services. A few years ago in Racine county only one dentist accepted Medicaid and she was a pediatric dentist. The payments to dentists were so low that they couldn’t justify accepting them as payment in full, they would lose money on every patient visit. We’re seeing more and more of that in the rest of the medical world. As states ad thousands and thousands of people to their Medicaid programs, they have to pay for their care from a fixed sized pot of money, meaning that payments per visit will continue to shrink. This article points this out with an actual example of billed charges and paid in full payments from Medicaid. I don’t think that this is from Wisconsin and I don’t know how that state’s Medicaid payments mirror those in Wisconsin. But I do know that here in Wisconsin, primary care providers (family practice doctors, eye doctors, pediatricians) are being paid pennies on the dollar compared to even other heavily discounted health insurance plans such as Medicare. So before we start patting ourselves on the back about how great it is to have more people covered by government insurance plans, we need to consider that having a Medicaid ID card may get them seen in 8-10 weeks for non-urgent visits. And history has shown that when that happens, people head to the incorrect source for care, urgent care clinics and the hospital emergency department for colds, sore throats and skinned knees. Driving up the cost of their care and clogging the segment of our health care system that’s supposed to deal with truly urgent and emergent problems. I don’t claim to have an answer to fix all of our health care system’s problems, but I can guarantee that putting hundreds of thousands or millions of Americans on Medicaid or other government programs isn’t the answer. Vision Restoration – Many, Many Patients Need It And I Provide It! I’ve been practicing for over two decades now and I’ve seen incredible changes and advancements in eye care. I’ve seen the incidence of vision loss from Diabetic Eye Disease decline, I’ve seen more and more of my patients (as a percentage) have Macular Degeneration and I’ve seen more and more healthy young patients who can’t see 20/20 with standard glasses or contact lenses. I’m seeing less vision loss in Diabetics due to earlier diagnosis and better treatment. More Macular Degeneration due to patients living much longer and developing more chronic eye diseases. And I’m seeing more patients with “sub-optimal vision” due to undergoing refractive surgery. I’m in no way “anti-refractive surgery”, the vast majority of patients do very well and have their vision correction goals met. 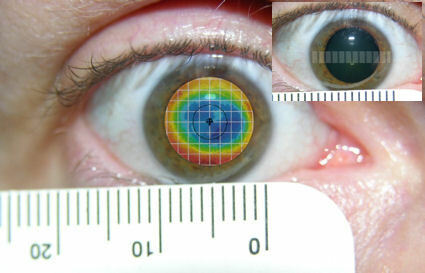 However, many patients are either left with glare and halos/starbursting around lights due to a small treatment zone and a high degree of correction, or with irregular astigmatism caused by improper healing, poor surgical technique or complications during their post operative period. Many of the patients with glare and halos have simply “learned to live with it” and don’t realize that these symptoms can usually be reduced. 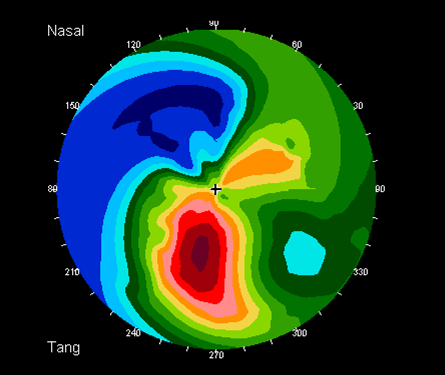 Sometimes with just a standard soft contact lens, sometimes with topical eye drops and sometimes with standard glasses. Some of these patients however require a more advanced type of vision correction to truly correct their vision and remove their symptoms. I’ll get into the treatment in a bit. Patients with irregular astigmatism are almost never truly corrected with traditional glasses or contact lenses and require either a custom RGP lens or what is called a Scleral Lens. Both of these lenses reduce or eliminate blur, glare and halos by acting as the single refracting surface of the eye/optical system. RGP lenses have been around since the mid 1980’s and can many times be designed in a manner that eliminates visual symptoms with decent lens comfort. In order to more comfortably correct patients like this however, Scleral Lenses are often needed. These lenses are very large compared to a traditional RGP lens. Many times even a bit larger a soft contact lens. This puts the weight and contact point of the lens out onto the white of the eye instead of on the cornea (which is the irregular surface I’m trying to correct for. Because of this, lens comfort is typically far superior to that of RGP lenses, but still providing the desired vision correction. Its been amazing to refit patients (many whom I’ve fit previously) from RGP lenses to Scleral Lenses. The comfort difference is striking for the patients, and the vision is more stable too! 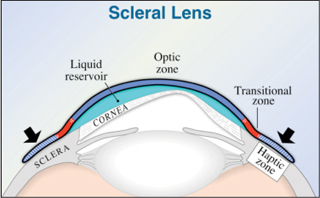 The drawback of the Scleral Lens is the cost. The fee for fitting these lenses and for the lenses themselves is about 2.5-3.5 times that of RGP lenses. Manufacturing these lenses is very time intensive, as is the design and fitting process. For this reason, not many eye doctors are fitting these lenses. I’ve committed to fitting these lenses on patients for whom they are appropriate. I have invested in the necessary lens fitting sets and personal/professional education required to become proficient in their design and fitting. Patients who would like to find out if Scleral Lenses are right for them can see me for a no fee/no obligation consultation, just by calling my office at (262) 752-2020. There’s a Corollary To This Too….. This short blog post talks about not believing every article that you read, its about health care articles in particular. That advice is good for the general public/patients, and for health care providers. We’re constantly bombarded by articles screaming things that seem to make sense, but might not be true, that sound too good to be true but may or may not be, and by articles that just don’t seem to make sense, but might. It pays to have a healthy dose of skepticism today, as it really always has. But we all need to remember the corollary to that, “Just because its on the internet doesn’t mean its true”. This Doesn’t Surprise Me At All, But It Upsets Me…. Just about anyone who has thought about the “Affordable Care Act” and its financing came to this conclusion, its too bad that the “Spender In Chief” and his cronies in Congress were blinded by desire to do something that “feels so right” but costs too much. Our insurance system/industry needed modification/fixing, but the current “solution” isn’t going to work, in fact, its made it worse for most people with higher premiums and higher deductibles to go with them. I continue to think about all of the options for my patients and my practice as we continue to navigate the uncharted waters of the current health care system. The Movement Is Upon Us…. We’ll be moving the office from our current location to One Main St on Thursday November 20th. Norby and Son’s will be showing up at 8:00am that morning to do the physical move and Clear Com and TDS Metrocom will be taking care of moving the phone and internet service that same day. Our phones will be forwarded to a cell phone so we won’t be out of touch during the move. Once the phones are back up and running, we’ll cancel the forwarding. I’ll be spending Thursday and Friday getting the exam rooms and all of our technology back up and running. I can comfortably say that I’m not looking forward to that task! Our first day of scheduled patient visits will be the following Monday but I will be able to take care of any urgent eye care needs during the move so don’t hesitate to call at any time.